Nothing Sacred. Selznick International Pictures 1937. It seems like I’ve run into “dealing with unusual problems from an erroneous medical report” before, but I can’t recall where. Some sitcom episodes may be coming to mind, but I think I’ve seen movies based on the idea too. I must have seen Carole Lombard in movies before, but apparently not in movies reviewed here as she doesn’t seem to have a preexisting tag. The same for Fredric March, though I have even less of an idea what to expect from him. Anyway, the pair are tied together by a medical mistake. She was expected to be dying, and he was apparently somewhat responsible for the media coverage, and then she turns out to be healthy, and they have to… fix that. Somehow. By verbally sparring, apparently. The New York Morning Star newspaper is disgraced when the visiting Sultan they brought to celebrity in the city is revealed to only be a local shoe shiner, and Wally Cook, the reporter who was first taken in by him, is itching to redeem himself. He decides to do a human interest profile of Hazel Flagg, the young woman in Vermont who was diagnosed with terminal radium poisoning, and goes to her quiet town to whisk her away to New York for a few weeks of happiness before the end. However, just before he finds her, her doctor informs her that it was a complete misdiagnosis. This isn’t entirely welcome news, since she’d planned to spend her savings on a trip to New York and now can’t. So when Wally comes to present his offer, she lets him and the rest of New York City believe she really is dying so she can get her exciting, glamorous trip after all. While she’s being mourned by a city under false pretenses, Wally falls in love with her and grows disillusioned with the town’s flavor of the week celebrity fawning, and Hazel can’t bear to live the lie of her impending death. From the descriptions I’d seen, I thought that Hazel was going to get her big feature and only then learn of the misdiagnosis, leaving her and Wally to spend most of the movie trying to do damage control, when in fact it’s only the last act that anyone other than Hazel and her doctor know. It’s considered a screwball comedy, but the courtship arguing that’s usually a big part of the screwball formula only comes out when Wally learns she’s faking. The rest is mostly dramatic irony, satire of celebrity culture, and character actors clowning. Many of the character actors were surprisingly diverse, probably coming from the same understanding of New York City culture that fuels the indictment of how people dote over the celebrity of the hour. By modern standards, a black shoeshiner, a troop of Scandinavian firefighters, a collection of central European doctors, and whatever blue collar background Maxie Levinsky’s bit part is aren’t all that impressive, and it’s mostly played for dialect comedy, but it’s a wide variety for a film about upper middle class people made in the 1930s. They’re all fairly well respected, if tweaked, as well. The fake Sultan isn’t portrayed as at all devious and is probably more respectable than the Morning Star editor his act humiliated. The problem with movies from this era is that lead actors seem so homogeneous to me. It seems as though there was one stock leading man and one stock leading woman, and only people who could play that character that way got leading roles. 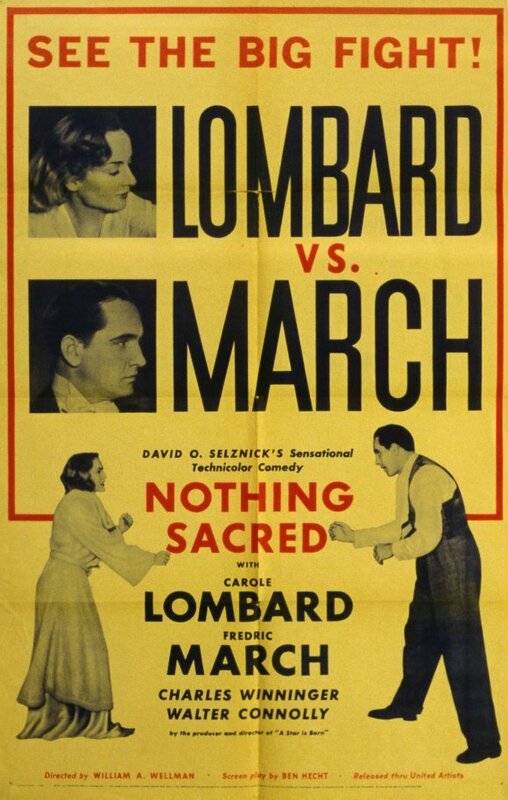 I’m sure if I saw Lombard or March side by side with contemporaries I could find differences in how they play their parts, but the standard was so narrow at the time they all blur together, and only the writing stands out. Indeed, it was a very good era for dialogue and story. There’s nothing too remarkable here, but nothing to dismiss it for either. I could see the story playing out not much differently in a modern setting, although perhaps involving the rest of the nation. It has a bit of a point, but that doesn’t get in the way of having some fun.